← #EatPrayPlay – Would you like to join the cuisine and culture trip I’m hosting to #India November 7 – 23, 2015? 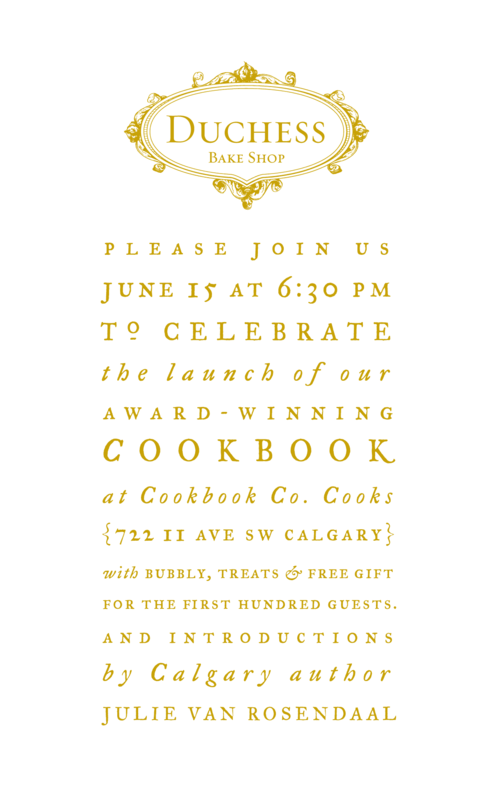 The organizers of this lovely event tell me that Duchess Bakeshop owner, Giselle Courteau and her team, have baked lots of treats so pop by tonight on your way home from work or take a break from home and come in for some freshly made goodies and freshly shaken cocktails from Calgary’s newest cocktail bar Proof. I had a chance to visit The Duchess Bakeshop last winter in Edmonton. I bought a copy of their beautiful cookbook for a dear baking friend for Christmas. Tonight I’ll go and pick up one for me! Memories of my visit are haunting me. I liked Provisions – their baking supply store – as much as the bakery (that might be a lie – wouldn’t want a truth detector right now) and I stocked up on some great utensils to help make my home baking look a little more professional. Not that my results will ever come close to the beauty of the creations at The Duchess Bakeshop but its nice that even if I can’t make all their goodies, I can at least have a few of their gadgets. Here’s a little look inside that beautiful Edmonton shop – visiting us here in Calgary for this one special night. I’m going to go down, try what they are sharing and savour it all until my next visit to Edmonton. See you tonight.